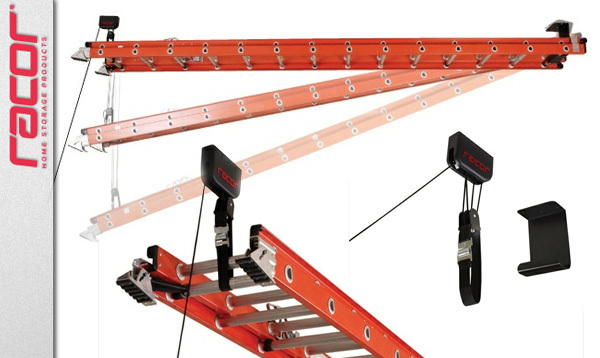 Currently viewing the category: "Racor"
While the name “Ladder Lift” sounds like an old person sitting in a chair that takes 30 minutes to creep its way up a flight of stairs, it’s actually a way to reclaim valuable wall space by putting any rig up to 150 lbs. on the ceiling instead. As far as we can tell, it operates much like blinds: link the top rung of a ladder to the hook mounted to a ceiling joist, attach the strap from the line to the bottom rung, then haul away and lock the cord. Even heavy ladders are manageable because you’re not lifting the entire weight of the ladder, and the block-and-tackle provides an 8:1 mechanical advantage. I can’t speak for any other area, but here in North Texas cycling seems to be steadily climbing to become one of the most popular outdoor activities (hey, we love soccer now, too — anything can happen). Recently even I started to re-familiarize myself with the West’s new favorite saddle. This, of course, brings the dilemma of shop space: Vehicles and tools/storage get the floor; everything else steps aside. 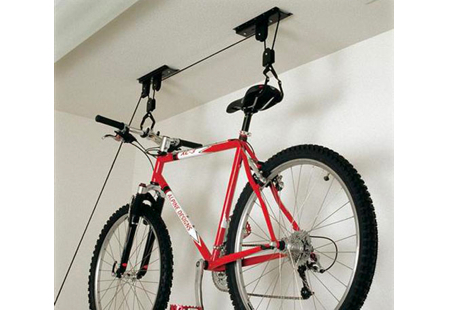 Amazon is currently selling the Racor PBH-1R ceiling-mounted bike lift for $18.43, more than half off normal retail, and Prime eligible. The specs: one 48-foot rope with a locking mechanism good for ceilings up to 14 feet high, a solid steel hardware pulley system, a rope cleat, and a couple of wood screws. Installation’s up to you (make sure to drag out the stud finder for drywall) and requires only a few basic hand tools — a Phillips screwdriver, drill with 1/8″ bit, and tape measure. Racor says the system will hold up to 50 lbs., though if you ask me, that’s on the heavy side for a bike.